A few times a year, the Spinrite Factory Outlet located in Listowel Ontario has tent sales that clear out yarn. The tent sales attract thousands of people from various regions of Canada, primarily Ontario Canada, as well as northern United States residents. Due to strong demand by the public to ship items seen in the tent sale photographs, Tent Sale Yarn prices are now available to the general public online and shipped directly to your home. This is only available to Canadian and USA addresses. As expected, please note that shipping is extra. The e-Tent Online Store officially opened yesterday and will be open year around. I was officially told that the stock you see online will change as stock is sold out and replenished with a new product. 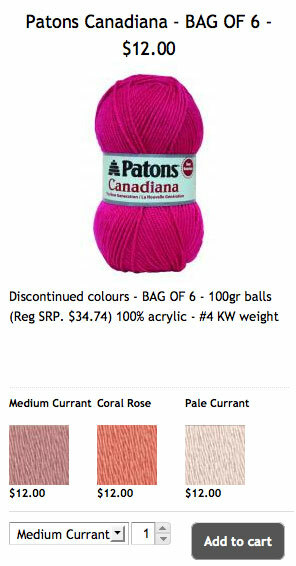 Most of the yarns sold are either discontinued yarn and/or overstock that must be sold. They are not playing games as the yarn sale deals are phenomenal and is priced to sell out. To keep my blog honest, I decided to do a Shipping Price Test to determine if the shipping is comparable. I did a mock order of a few things, it calculated my shipping and to my delight, the order came to just under $9 for shipping the products to my home. This is very reasonable considering the size of box it would be and the time frame to get it to me. I ship a lot of boxes out with our crochet challenges and know all to well how much shipping should be. I am fully convinced that their shipping rates are comparable to the marketplace. It’s nice to know that when that they don’t overcharge in the shipping to compensate for the low prices. So here’s to a great launch of the e-Tent Year Round Tent Sale exclusively offered by Spinrite Factory Outlet. The best thing of all is when you see me there next time, you have an opportunity to purchase some of the items you see in photos by going online to purchase your yarn without having to drive all the way to Spinrite Factory Outlet. I’m really excited as now my fans from Canada and the USA can enjoy the savings in yarn that you see in my videos and photos posted online. This entry was posted in Announcements and tagged Canada, crochet crowd, E-Tent, Listowel Ontario, Mikey, Ontario, Sale, Spinrite Factory Outlet, Yarn. Bookmark the permalink. Thank you so much for this awesome news and the link!!! I ordered 36 skeins last night and my shipping was only $10.95. I think it’s a great deal, I live in Kentucky!!! Some of the places I’ve ordered from the shipping cost more than the yarn, I only ordered from them once. This is awsome. I hope that they will be having more of a selection as they grow with this idea. I would LOVE to take advantage of this great sale…but it will be some other person’s gain. Can’t afford it right now, darn it! I LOVE the way you roll Mike! This is great thank you Spinrite and Mikey for passing the word around. I am sharing this with all my friends and asking them, when they want me to make something to order the yarn from Spinrite. Keeping it Canadian makes it all even more worth while. Thanks a bunch, and crochet on. Whoot! Whoot! Yeah for Spinrite getting an e-commerce site so those of us in USA can buy yarn at the tent sale too! I hope they expand and let us pick from a vast selection. I played around with the site and shipping was not too bad for USA…..
That is awesome deal Mikey shipping usually kills my orders , can’t really go wrong , like I said on FB..I am in trouble hahaha!!!! !